Anthony Benavides never knew what to expect on most mornings when he’d go to crank up the 40-year-old, hand-me-down Zamboni at Detroit’s Clark Park ice rink. Sometimes it would fire up. Sometimes it would catch fire. Sometimes it would work fine. Sometimes it would work, then suddenly break down in the middle of resurfacing the only regulation-size outdoor hockey rink within Detroit’s city limits. Benavides’ mornings of mystery are now over, thanks to the National Hockey League and the Detroit Red Wings Foundation. 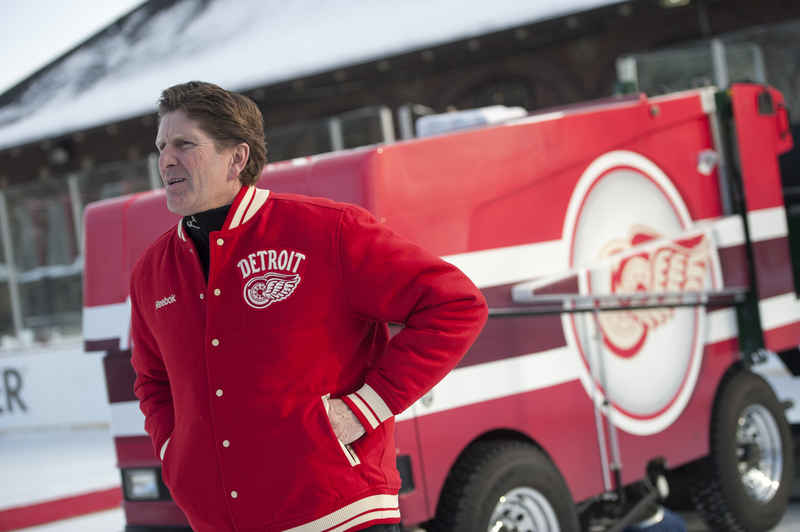 The league and foundation Monday unveiled a new, sparkling Red Wings red Zamboni to replace the rusting ancient wonder and showcased a host of other enhancements and upgrades they donated to Clark Park as part of the 2014 Bridgestone NHL Winter Classic Legacy Initiative. The improvements will better enable the 29-acre park and recreation center to carry out its mission of providing educational, social, and athletic services to the hard-scrabble Southwest Detroit community it serves. No more resurfacing hassles for Detroit’s Clark Park with this new Zamboni from the NHL and Red Wings Foundation. In addition to the Zamboni, the park received upgraded lighting around the outdoor rink and parking lot, an upgraded rink refrigeration system, snow removal equipment for its ice hockey and skating programs, a new ice surface and rink boards, new bicycle racks, and enhancements for the park’s recycling program. The improvements were done with the help of DTE Energy, Johnson Controls, York, Disenos Ornamental Iron, CleanRiver and NHL Green, and funded by the NHL and Red Wings Foundation, an affiliate of Ilitch Charities. The Red Wings are owned by Mike Ilitch. 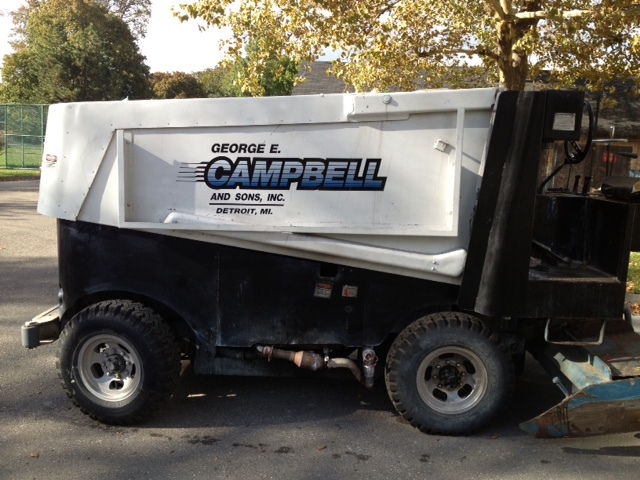 Built in 1973 and bought used, Clark Park’s old Zamboni can finally retire. For more than a decade, Clark Park has been a part of “Hockey is for Everyone,” an NHL initiative that provides support and unique programming to some 40 nonprofit youth hockey organizations across North America. It offers children of all backgrounds the opportunity and access to learn to play hockey at little or no cost. “We’ve seen how successful Hockey is for Everyone has been in this community and how important Clark Park is to this area,” said Brian Jennings, the NHL’s chief marketing officer. The park itself is an example of the resiliency of the people of Detroit and their drive not to give in to tough times. The city government planned to close the park in 1991 because it couldn’t afford to operate it. But residents of the community vowed to keep it open and formed the nonprofit Clark Park Coalition. Red Wings Coach Mike Babcock and Clark Park’s new set of wheels (Photo Courtesy of The Detroit News/David Guralnick). The coalition took over much of the financial obligation from the city and operates the park today largely through a patchwork of hundreds of thousands of dollars in grants and donations. Along with the “Hockey is for Everyone” programs, the park offers year-round sports programming for more than 1,200 boys and girls. The recreation center also offers after-school tutoring, arts and crafts and other activities. The park’s football and baseball fields are often used by four nearby Detroit schools.